Wahoo are a beautiful fish that often prove very elusive. They have excellent eyesight, great camouflage, razor sharp teeth, and are often finicky. 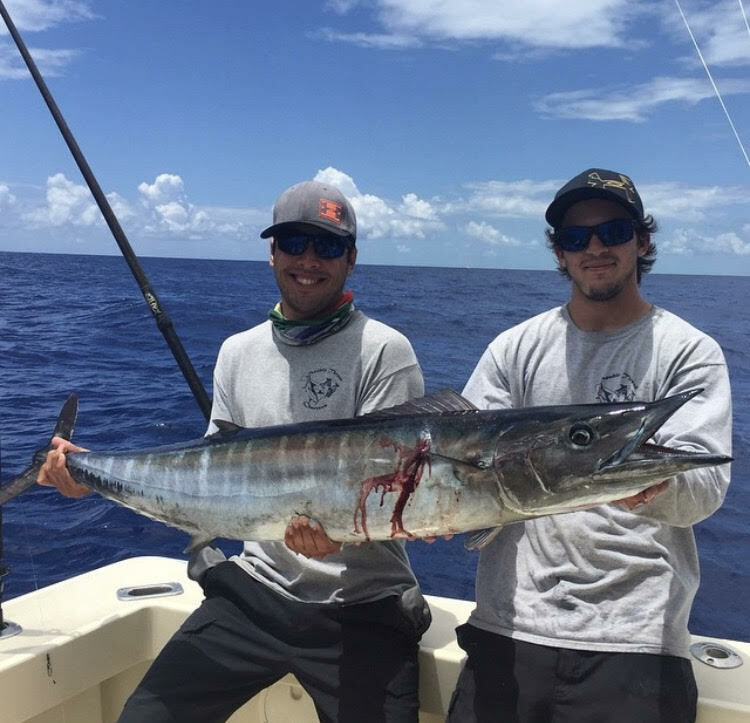 Wahoo in Miami average about 20-50 pounds with the exception of smaller fish you often find under floating debris. Wahoo are always a possibility when fishing offshore. We catch them kite fishing, trolling, and vertical jigging. The different techniques vary depending on time and place. The first and most productive technique for wahoo is trolling. In the Bahamas and sometimes in South Florida, high speed trolling can be very effective. Wahoo are one of the fastest fish in the ocean and have no problem eating a bait moving at 12-18 mph. When high speed trolling for wahoo most crews deploy 3-5 lines at a staggered distance behind the boat. These lures usually have weighted heads or a 1-3lb cigar lead on cable in front of them. This weight allows them to stay in the water when pulled at high speeds. For lures, most people prefer 10-15 inch lures rigged with cable and large j-hooks (single or double hook rigs). Dark colors are usually preferred because they are easier to see in the white wash behind a boat. When high speed trolling, it is best to work areas with strong current and sharp drop offs. The best depths are usually 200-1000 feet in areas with a lot of tuna or flying fish. Some boats high speed troll off South Florida but it can be a little slow sometimes. If you do decide to high speed troll locally, it is best to go early in the morning or late in the afternoon on or near the full moon. Find areas with blue water and current and your chances increase dramatically. By slow we mean 6-8 knots. I should really refer to this as normal speed trolling for wahoo. 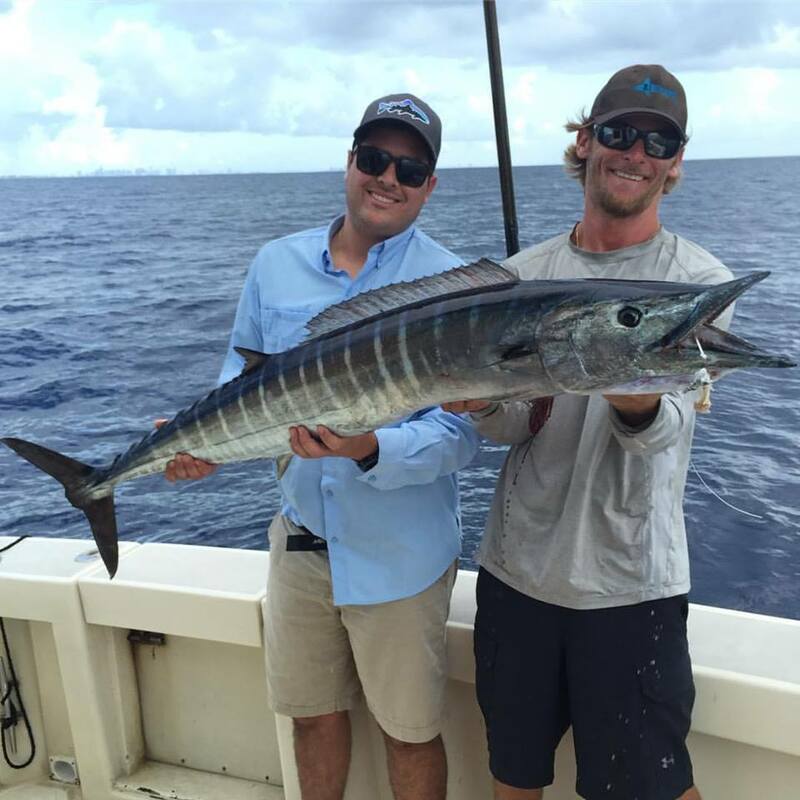 When we catch our wahoo off Miami it is usually while trolling at a normal pace. Most of our wahoo are caught off the planers. We deploy 2 planers when targetting wahoo which either have strips with sea-witches or drone spoons. These planer rods run at 20-50 feet deep and are deadly for kingfish, blacken tuna, wahoo, and more. Since wahoo aren't always guaranteed, our planers are usually accompanied by 4 surface baits. By mixing ballyhoo and feathers up top and using planers to cover the water column, you can catch just about anything on the troll. We usually troll in the 200-300 foot range if we are near a full moon or our clients request wahoo. If you put in the time you can usually put one or two in the boat if conditions permit. Trolling large swimming plugs and swimming ballyhoo also get their attention, though bites are fewer and farther in between. All of these trolling techniques should be focused on the drop off from 150-300 feet. Working different contours in low light conditions during an outgoing tide can be very productive. We seldom catch wahoo off the kites but they are definitely a treat when we do. We fish a lot of monofilament leaders with circle hooks while kite fishing because sailfish are generally the target species. Without wire leaders you risk getting cut off by toothy fish but you would be surprised by how many wahoo and big kingfish we have caught without wire. You sometimes get lucky when the circle hook finds it's hold in the corner of their mouthes. If there are a lot of kingfish or wahoo around we switch to wire or titanium leaders. These rigs coupled with large blue runners, goggle eye, or herring can be deadly for big kingfish and the occasional wahoo. Wahoo also congregate under floating debris though they typically hold deeper in the water column. Dropping a dark colored jig a few hundred feet down and then ripping it towards the surface is a surefire way to elicit a strike. Wahoo have the ability to swim almost motionless in the water column but at the same time can reach incredible bursts of speed in the blink of an eye. Their dark blue and purple tiger striped bodies make them nearly invisible in the depths. Big wahoo also hunker below schools of bonito and tuna, waiting to strike with their mouths wide open. Wahoo slice right through their prey with surgically sharp teeth then return to the slowly sinking remains and gobble up the rest. Though they fight similar to large kingfish, a wahoo's initial run is much more impressive. Sharp hooks are a must as their mouths are hard as rocks, and constant head shaking allows duller hooks to lose their hold. In addition to vertical jigs, planers also work well under floating debris. Wahoo meat is delicious any way you prepare it, but many are unaware of their delicious sushi-grade quality. These are definitely a trophy fish on many people's bucket list.